The French luxury label unveiled the Boy.Friend Skeleton, equipped with a new Calibre 3 in-house mechanical skeleton movement, at Baselworld 2018. Created in 2015, Chanel's "Boy.Friend" has become an icon of the watch world, standing out from the crowd with its octagonal case and masculine influences. Released in various materials over the last two years, the watch returns in 2018 with a skeleton movement, bringing a fresh new design to this emblematic model from the French luxury label. 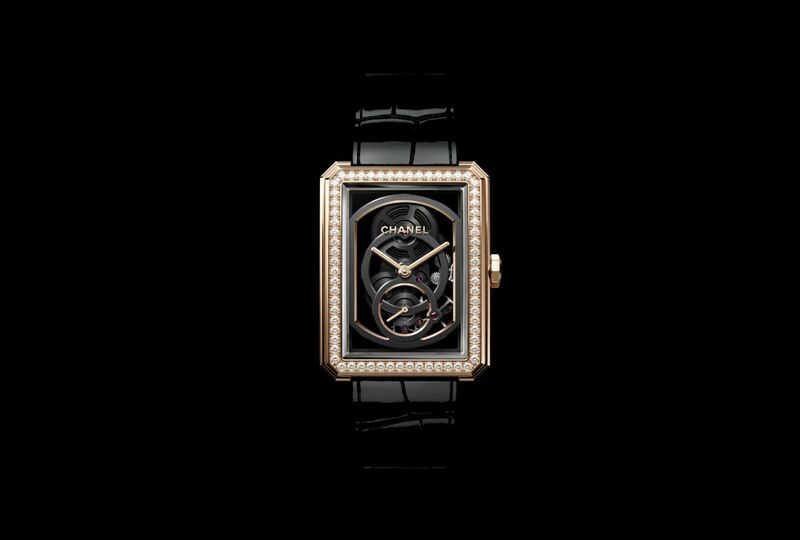 Chanel spent no less than three years developing the new in-house movement, called "Calibre 3." This skeleton movement, visible through the watch's case, comprises a series of interlinked, vertically aligned circles, contrasting with the watch's octagonal shape. Presented at Baselworld, the "Boy.Friend Skeleton Calibre 3" has an 18-carat beige gold case and bezel. This precious metal is also used on the crown, the plated hands, and the glossy black alligator strap's pin buckle. The watch runs on the Chanel Calibre 3 in-house skeleton movement, with hours, minutes and seconds functions, and a 55-hour power reserve. A second version of Chanel's new skeleton model features a bezel set with 66 brilliant-cut diamonds and a pin buckle set with 48 brilliant-cut diamonds.